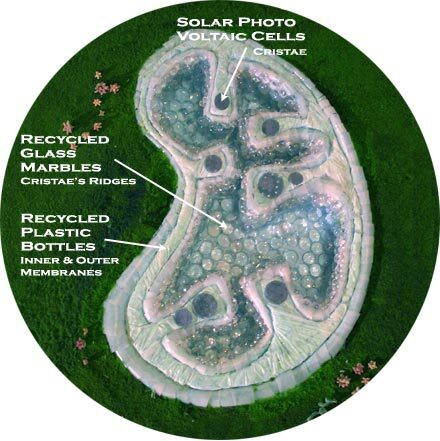 Mitochondrion Renewable Energy Pool (2004) is made with recycled materials and solar power, the work is planned for nine acres on the grounds of the “Muckenthaler Cultural Center” located in Fullerton, CA. It is fitting that this fountain is powered by solar energy and not dependant on an electrical cable because the mitochondria with their double membrane are much more independent than other organelles within the cell. For example, mitochondria reproduce by splitting in half, like a bacteria, and are not made of cellular constituents like other organelles. They also have their own set of DNA which is inherited maternally. The ridged folded structures within the mitochondria called “cristae” create maximum surface area and efficiency in converting energy.